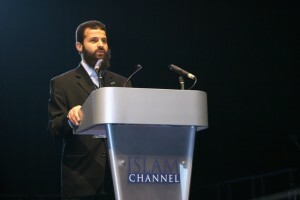 Mohamed Ali, CEO of Islam Channel, has marked a milestone for a Muslim voice in the media, through creating ingenious and practical television; he has aspired to and achieved an exceptional track record in the design and delivery of a range of key and iconic schemes for Muslims in the UK and around the world. Further projects include The Global Peace and Unity Event 2005, 2006, 2007 & 2008 attracting over 60,000 Muslims and non-Muslims to gather together across the two day event, making The GP&U a unique and distinctive event. The GP&U has proved to break barriers and build bridges between the variety of cultures that follow the Islamic faith, as well as with other communities. Mohamed Ali has begun a phenomenon in media, starting with representation for Muslims within the UK and expanding out to both Muslims and non-Muslims around the globe. In 1987 he was arrested as an activist (under Bourguiba); Ben Ali, the recently deposed dictator, took over in November of that year, but Mohamed was not released until late 1988. In 1989 he was again arrested and held for a month. At this time, Amnesty International adopted him as a prisoner of conscience. In 1990 he left Tunisia for good, travelling throughout many countries, but eventually living in London, where he completed two degrees at Westminster University: one in English and Arabic and another in Politics. He also undertook an MA at SOAS in Applied Linguistics and Bilingual Translation. In 2004 he founded the Islam Channel which broadcasts to over 130 countries and is, according to Home Office statistics, the most watched channels by Muslims in the UK. In 2005, the first ever Global Peace & Unity Event was held attracting over 30,000 Muslims. This has grown each year that it has been held (2005, 2006, 2007, 2008, 2010). In 2006 he organised the first conference on Islamophobia in Denmark. In 2008 he was one of the founding trustees of ENGAGE, set up to encourage civic and political participation by Muslims in British society.